1. Remembrance - November 26th will be the 27th Anniversary of the death of one of our 1/83rd Brothers. David Angelo Barbarino, a Veteran of "A" Battery (1970) who died 11/26/91 as a results of wounds sustained 4/13/70. More on David can be found on our website. Lest we Forget. Remembrance - December 29th will be the 52nd Anniversary of the death of one of our 1/83rd Brothers who did not make it home from Vietnam, Clarence E. Everett, a Veteran of HQ Battery (1966). More on Clarence can be found on our website. 2. These Updates - Those of you who follow these periodic updates will have noticed that I don't make them as often as I did in the past. There is only one reason for that and is that I don't get anywhere near the news from you guys as I used to. I don't know if that indicates a lessening of interest in the happenings of the 1/83rd or not. The only way these updates can go out more frequently is if you all provide some news that can be shared with the group. In that same vein, it would really be nice if you could also send along good news as it occurs. It seems like all I hear about is sad or bad news but something positive to report would cheer us all up. 3. Good News - Here is some really good news that I found out about just before the Reunion. David Jackson (HQ Battery 67-68) recently was married. Congratulations to David and his new bride Cynthia!! If you want to send along your own good wishes, David's contact information can be found on the Full Roster. 4. 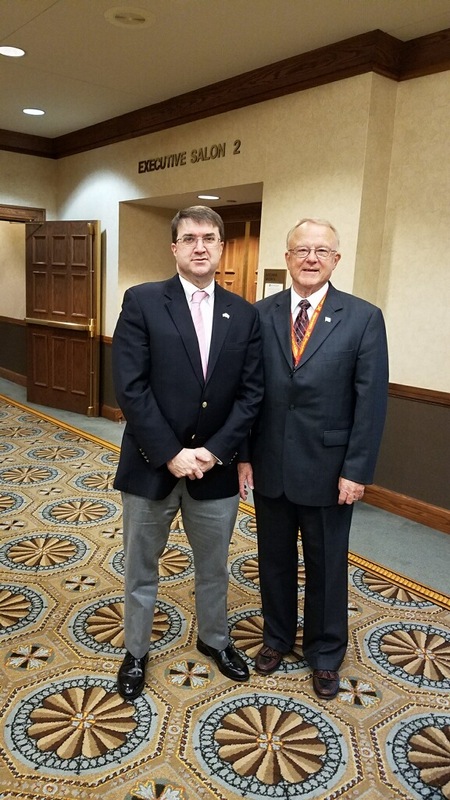 Robert Wilkie Jr. VA Secretary - I had sent a letter to Secretary Wilkie congratulating him on behalf of the 1/83rd on his new job and letting him know of our unit's connection to his late Father, Robert Wilkie Sr. who was the CO of Service Battery in 1966. In that same letter I invited him to our Reunion in San Antonio and much to my great surprise he graciously accepted. His appearance was a highlight of the Reunion. He not only stayed twice as long as expected, he spent extra time mingling with everyone and had a question and answer session after his remarks. Jay Schweer who was Capt Wilkie's Battery Clerk introduced the Secretary to the group. After all this he then had a private visit with Don Eikenberry, Jay Schweer and Danny Sandoval. All these men served under Capt Wilkie in 1966. During this entire visit, Secretary Wilkie (and his staff) could not have been more cordial to everyone. It was a very special time. Here is photo of Jay and Secretary Wilkie. I have not yet received very many photos from anyone at the Reunion but as I do I will add them to our website. "...with the appointment of Bob Wilkie’s son as the new VA Secretary, this is the second one who’s parent I have known and worked or served with. I worked at the IRS with VA Secretary Jesse Brown’s mother. Paul"
6. Vietnam Veterans Education Center at the Wall - This project has taken a drastic change in plans. Read more here. 7. Sleeping arrangements on the General Edwin D. Patrick - Pete Etchamendy (B Battery 66-67) sent along a great photo that shows the "spacious" sleeping arrangements that most of us had on the cruise to Vietnam in 1966. We have also come to learn that a few of our lucky comrades had private cabins and other such locations to sleep in. They apparently kept that news from the rest of us for these many years for which they will be forever reminded by those of us who now know about this. They probably figured we would toss them overboard had we found out then!! You can see the photo on this page. 8. Inactive and Missing from the 1/83rd - There is a long-standing page on our website where I list men that are either missing, inactive or trying to be located by someone in our group. I am asking everyone to review that page and let me know if you have updates you would like me to make. Please be aware that I have just added a new request by our Roger Koopman (68-69) who is trying to find a guy he served with. "I meant to send you this article back in February of this year when the Albuquerque Journal published an article about the 50th anniversary of the Tet Offensive. Included in the article along with the stories about other veterans during Tet is the account of our battery (B) almost landing in North Vietnam. It also includes pictures of our guns and me then and me and Doug Clifton in 2015. The paper contacted me because a fellow Vietnam veteran from New Mexico who is a good friend of mine told the paper about this adventure. They then contacted me and I worked with them." Ed. Note - I will be adding this story to the website. 10. 1/83rd Website - Please let me know if you come across any links in my website that are broken. With so much content, it is inevitable that links go out of date so let me know if you find one that does not work. 11. Full Roster on Website - Check your entry on the Full Roster to make sure all your information is up to date. Notify me if any changes are necessary. If your email stops working, I cannot reach you if you have incomplete or incorrect contact details on the roster. I have recently become aware of several changes to contact info. It is important that you keep your contact information up to date on the Roster, it is the only that your buddies can find you! Let me know when things change. Please remember that all contact info that we have for our group can be found on the Full Roster. This is the best spot to start if you need to contact one of the group. 12. Support - Please let me know if anyone of you or your family have health situations so we can let everyone know of the need for our support. 1. Duane Johnson (66-67) sent this link, Crawdads, camaraderie and community. 2. Neal Schwartz (68-69) sent this link, Army seeks strategic cannon that can fire a round over 1,000 miles. 3. Les Spohr (68-69) sent this link, The Ultimate Survival Backpack. The term “land mine”, used to refer to a small explosive device concealed underground to destroy or disable enemy targets (ranging from combatants to vehicles and tanks), stems from the original practice of digging literal mine shafts under enemy territory and collapsing them, and later, filling them with explosives. 1. Ken Mitchell (70-71) had a suggestion for a new page on the website for photos of 8-inch or 175mm guns that have been seen in recent times. I have added that page here. Ken has already sent me a picture of an 8-inch. If anyone else has such photos send them along. 2. If you come across anything that you think may be a good addition to our website let me know. Also, if you have any questions or suggestions regarding the website, let me know. 3. Check out all the latest updates by looking at the website Table of Contents. Check your entry on the Full Roster to make sure all your information is up to date. Notify me if any changes are necessary. If your email stops working, I cannot reach you if you have incomplete contact details on the roster. Missing members of the 1/83rd Help us find those former 83rd members who haven't found us yet!! There is a long-standing page on our website where I list men that are either missing, inactive or trying to be located by someone in our group. I am asking everyone to review that page and let me know if you have updates you would like me to make. 1. If you are in contact or have contact info for any 1/83rd guys please contact them and tell them about our group or at least tell me and I will contact them. 2. Look through the roster on the website and if you know of others who are not listed, let me know who they are. Also, if you see any incorrect or missing info (including your own entry) let me know. 3. If you have copies of old orders tucked away someplace, send me a copy so I can make sure those names are on the roster. 4. Sometimes all it takes is a name and location and we can find someone but the more details we know the better our chances. Rules & Regs If anyone would like a current copy of the "Rules & Regs" document which has helpful information about using the website, let me know. Go to Contact Us and submit your request or email me directly. Advisory If you get an email from and it has a website link included anywhere within the email, most times you should be able to just click on the link and you will be taken to the website. Sometimes however, the link will not work because, in sending you the email, the link is deactivated although it is still usable. If this should happen, another way to use the link is to copy and paste it into the address line on your browser. Please be sure to let me know if you have any questions on this.